Not quite a sequel, but it's For the Sequel. 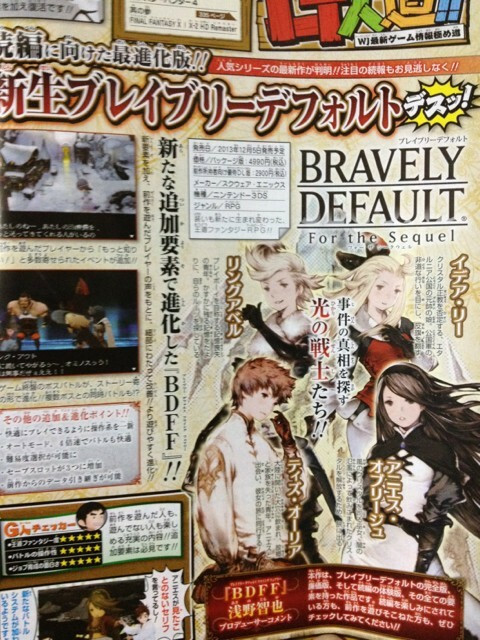 Square Enix confirmed Bravely Default: For the Sequel, a not-quite sequel to last year’s Bravely Default: Flying Fairy, in the latest issue of Weekly Jump. The game appears to be an evolution of the first game with added elements to garner interest in a sequel. It will have new events, reformed controls, an auto-battle mode, and a quad-speed battle option. There are now three save spots and players can select a difficulty level. It can also use data from the original game. Bravely Default: For the Sequel will launch on December 5 in Japan for 4,990 yen at retail and 2,900 yen via digital download.